Chief minister Mamata Banerjee today said as many as 108 people from Bengal were untraced in Nepal and her government was trying its best to gather details about their whereabouts. "The government is trying to collect information about the 108 people by checking with their families and even visiting their homes. We have gathered few numbers and the process of rechecking their status would continue," Mamata said at Uttarkanya, the administrative headquarters of north Bengal in Siliguri before telling Raj Kanojia, DG (coastal security), to run a check on the status of those missing. "A 24x7 helpline is being opened at Uttarkanya. As far as those who are still stranded, the government would send a bus to Kathmandu to bring them back. A senior officer would be going with the bus to oversee the entire process." The bus will leave Siliguri tomorrow. The chief minister was speaking soon after meeting top officials of the north Bengal development department and senior officials from the two districts of Darjeeling and Jalpaiguri for working on ways to combat natural disasters in this quake-prone zone of Bengal that has witnessed eight deaths till date. "We had information that 336 people, including tourists from Bengal, were stranded. Some of them have already returned and others have reached New Delhi," chief minister said. "Bengal's resident commissioner in New Delhi is making all arrangements to send them back by Rajdhani Express." Contact has been established with these tourists. Of the 108 untraced people, many are workers, some tourists and some wedding guests, said a senior official of the disaster management department. 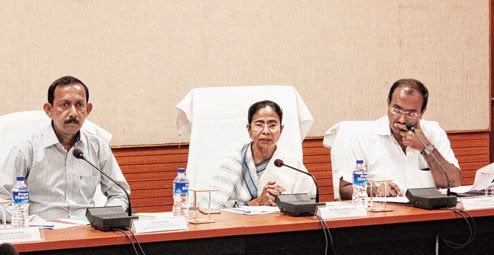 Officials of the department, who provided the figure of the missing persons to Mamata, said they had collated the figures from the control rooms they had set up in different parts of the state. "The control rooms have been receiving calls from the worried relatives of those who are missing in Nepal and want the state government to help in tracing them out," an officer of the disaster management department said. "They have collected the information on the missing from these calls and compiled a list. It is this list that we have provided to the chief minister." With Kathmandu's death toll steadily rising, senior officials present at today's meeting couldn't hide their concern on the number of people that remain untraced from Bengal. "The missing figure is based on the information reaching us as of now. It could well be more, though we hope that it's not so," said a senior official from the Darjeeling district. Senior officials said according to primary estimate, over 3,000 people from 62 blocks in 61 villages have been affected by the earthquake across the state and the process of assessment was still on. "Several government buildings, including schools, colleges and even hospitals have suffered damage. Many bridges too have been hit," Mamata said. "All the departments concerned, including health, PWD, panchayat and irrigation, have been asked to make a detailed assessment of the damage. It's a time-taking process. Once that is done, we will seek central assistance for carrying out the repairs." PWD officials who were present at the meeting admitted in private that there had been no intensive risk assessment of bridges and flyovers in north Bengal since the Bijonbari bridge collapse in October 2011 that left 41 dead. "The assessment includes estimation of the effects of multiple common hazards like abnormal traffic loads, environmental attacks and earthquakes. Such studies have not really happened," said an engineer.